Security testing is becoming a critical element in an organization development strategy. This is due to the increase in the number of breaches that the organization must deal with. If all other technology sectors are driven by reducing inefficiencies and increasing productivity, cybersecurity spending is driven by cybercrime. More than half of all breaches involve web application, yet than 10% of organizations ensure that all critical applications are reviewed for security before and during production. However, to balance between the cost for security testing and level of security confidence for applications is a necessary concern. In fact, many organizations cannot spend too much their money in hiring/ retaining or even using an external service to secure their applications. Addressing directly to the needs while balancing the cost of security. MeU Solutions has launched a new service called “1Secure”. 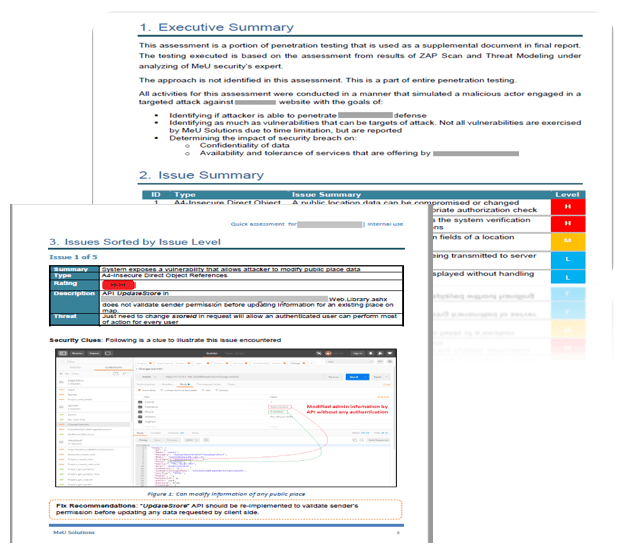 This service is to propose a systematic approach to assessments of their client’s infrastructure and web applications, is ideal for uncovering any risks their clients might be unaware of. 1Secure applies standards of OWASP Top 10 to exploit vulnerabilities and establish a level of confidence in web applications. The OWASP Top 10 is a powerful awareness document for web application security. It represents a broad consensus about the most critical security risks to web applications. This service is a 5-phase approach including Info Gathering, Threat Modelling, Vulnerability Analysis, Exploitation and Reporting & Consulting. The service is performed within 1.5 months, and their clients will receive a report for scanning results with analysis included only after 10 days (without charge during this period). At this point, their clients will decide if they continue using this service for a deep scan and penetration testing. This service package’s cost is ranging from $2,500USD to $3,500USD that it is decided by size & complexity of applications. The details of this service can be found at Here. If you are interested in knowing this service, please contact us. … The beauty of a smart solution is not only to solve given problems, but also to sharp our mind brighter. We’re poised to bring our execution excellence, high-performing teams and real-world track record to you. Office 1: 68 Nguyen Hue Street, District 1, Ho Chi Minh City, Vietnam. Office 2: 25 Street 2/9, Hai Chau Dist, Da Nang City, Vietnam. Give us your email, we will send to you our news regularly.